Review by AllTheBestFights.com: 2016-05-13, pretty good fight between Keith Tapia and Andrew Tabiti: it gets three stars. Both undefeated, the Puerto Rican Keith Tapia entered this fight with a perfect record of 17-0-0 (11 knockouts) and he is ranked as the No.41 cruiserweight in the world while his opponent, Andrew Tabiti, has a boxing record of 12-0-0 (11 KOs=92%) and he entered as the No.68 in the same weight class. Tapia fought five times last year beating Garrett Wilson in his last one while Tabiti won three fights defeating Tamas Lodi in his last. 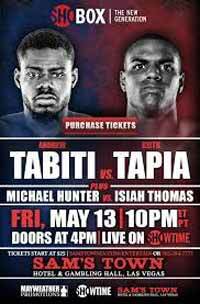 Tapia vs Tabiti is valid for the vacant NABF cruiserweight title. Watch the video and rate this fight!